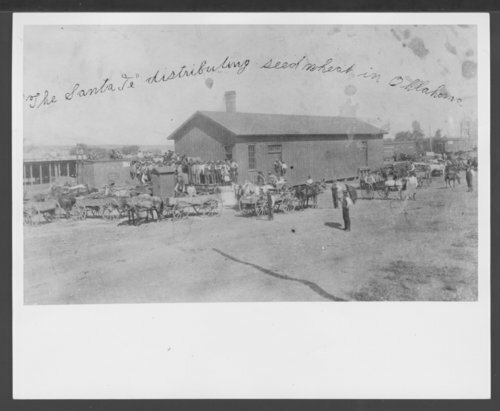 This black and white photograph shows a group of people gathered at the Atchison, Topeka & Santa Fe Railway Company depot in Guthrie, Oklahoma. The railroad company is distributing seed wheat for the first winter wheat crop in the territory. The farmers gave their notes for the seed and paid the notes when their crop was harvested. F. B. Houghton, former traffic vice president for ATSF, is sitting in the buggy drawn by the white horse.